As it was Marjools birthday on 23rd July we decided to find somewhere to eat out in the evening. 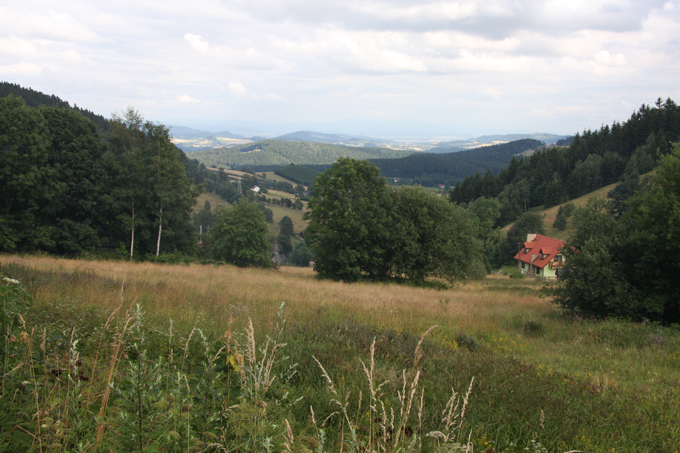 It was a remote rural area, but on the back roads from the A4 (E40) to Mielec somewhere near Przeclaw we found a really friendly little place. it was down a little alley at the side of a house and so nearly missed it. 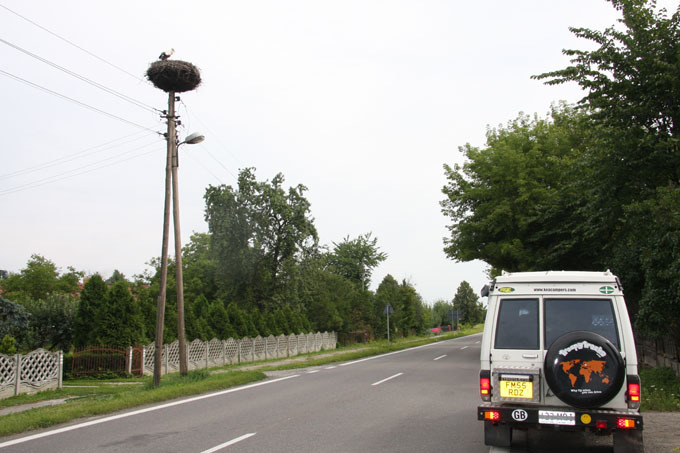 Just before we got there we saw another telegraph pole with a baby stork in a nest. 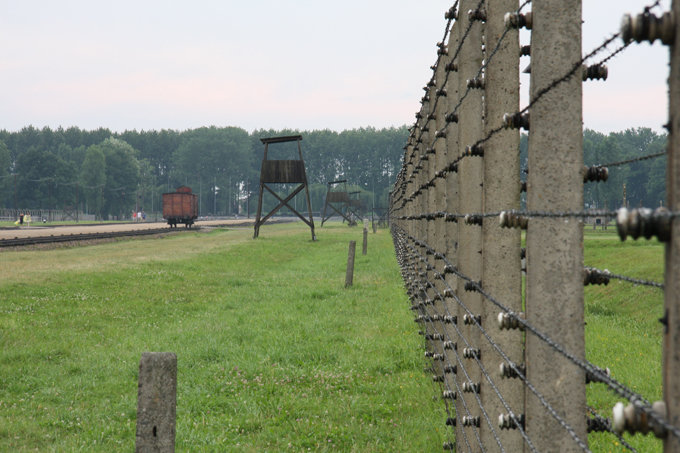 The tops of the poles have special cages on them to give the birds a place to nest. 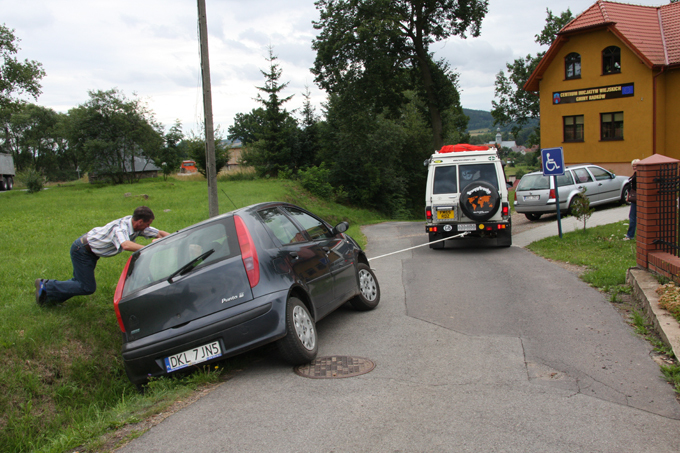 Just when we thought that we would have to park by the side of the road for the night …. a welcome sign! 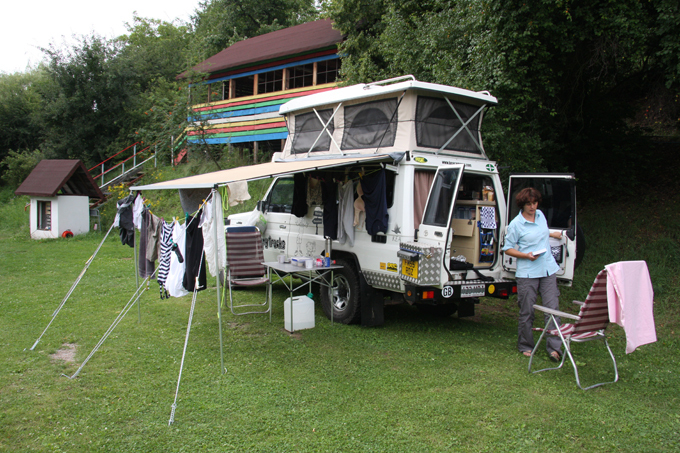 Although the place was empty when we arrived and decided to sleep there (in the camper), it soon filled up with locals and we enjoyed a few drinks (beer £1.00 for 500ml). Chicken chips and salad, two drinks and coffee was £7.00. Who says I don’t spoil Marjool! 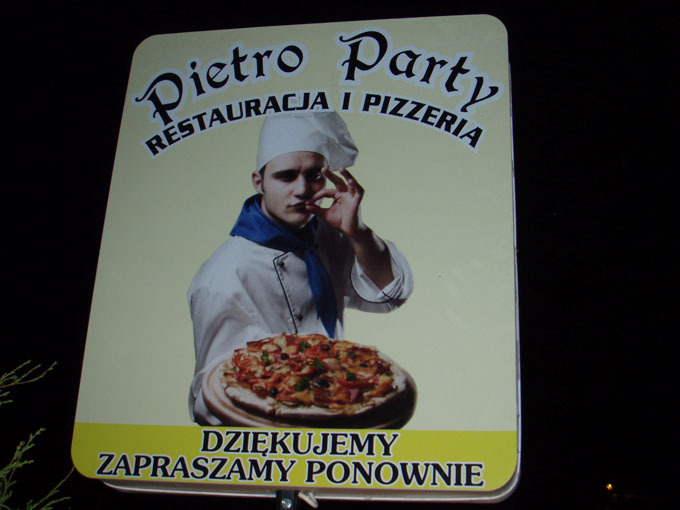 The owner and staff were really nice and the sweet girl behind the bar who spoke english looked after us really well. I hope she keeps in touch. The evening was rounded off in our favorite way with a bit of Karaoke!? Headed on to a town called Sandomierez which had a pretty market square. From there the weather changed for the worse and the skies filled with black storm clouds. We drove on some really rutted roads through the storm and had to pull over a couple of times and find side roads. The other traffic did not slow down and people were still overtaking in the opposite direction. Our wide tyres seem to follow the ruts and so we decided to wait it out until the heaviest downpours were over. Stopped for the night at a little lake by route 19 at a place called Firlej, where we found that we were within range of someone’s unlocked wifi. Its always worth a try! This morning we went to the salt mine in Wieliczka, only about 10km from Krakow, but not before we checked our email for birthday messages for Marjool. 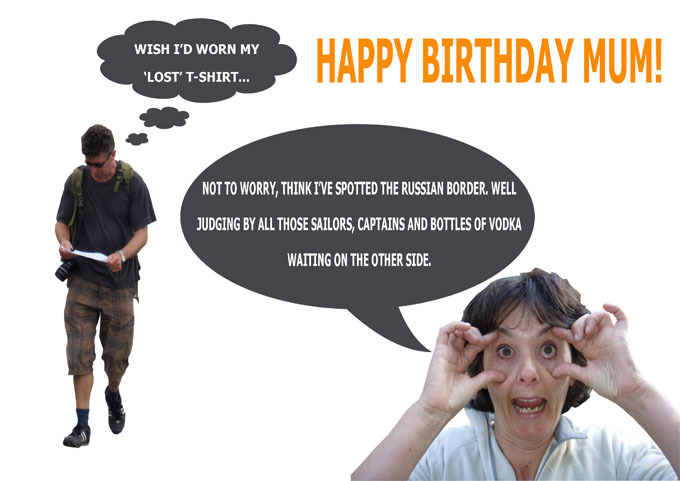 We knew we could rely on the boys to come up with a card with the most unflattering pictures. We were not disappointed!! 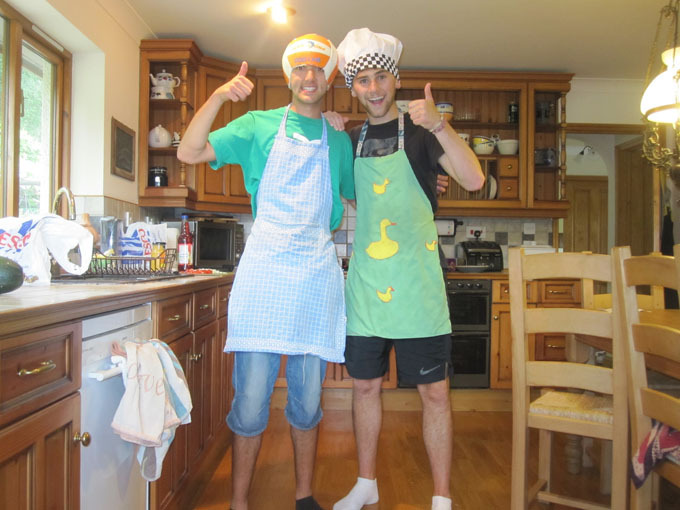 The boys also added a pictures of themselves to demonstrate that we had left the house in mature and capable hands! The salt mine was amazing. We walked down around 400 steps to descend 135 metres into the old mine workings. The mine stopped working in 1996 (ish) and is now used for tourism, conferences, events, services in the many chapels. Due to the microclimate within the mine there is also an underground treatment centre for ailments of the respiratory systems, asthma and allergies. 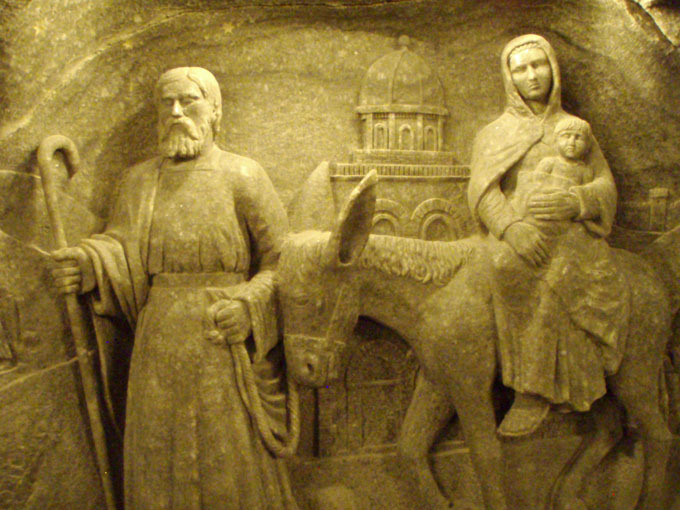 The main attraction for tourists are the many carvings from solid rock salt. 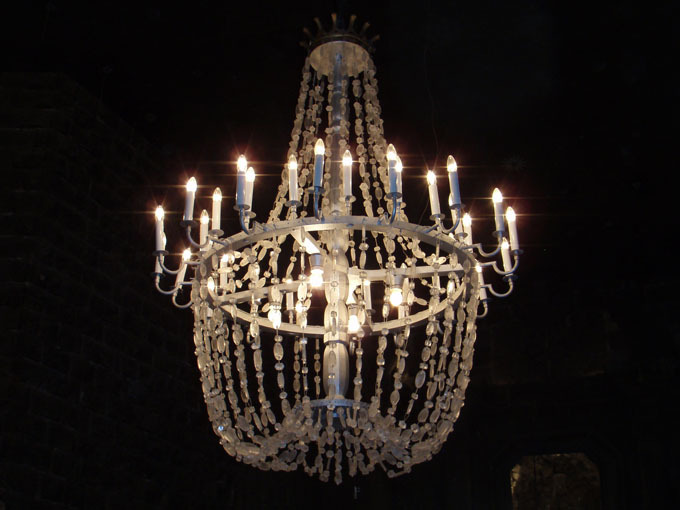 Even the chandeliers are carved from pure salt. 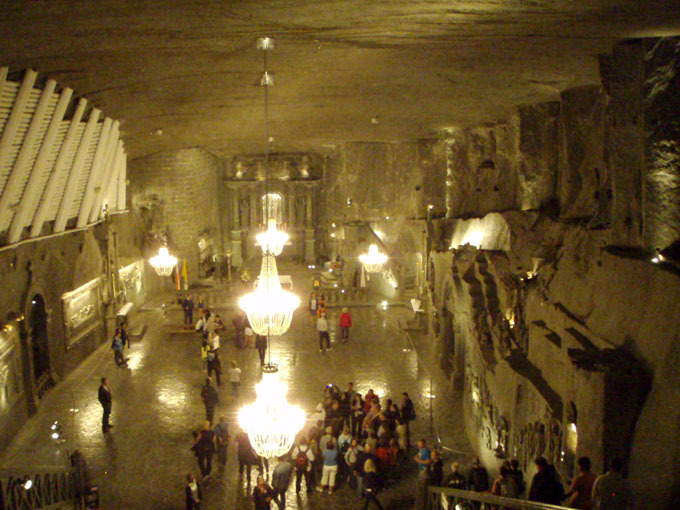 The biggest and most impressive chapel is called Chapel of St Kinga and is situated 101 metres underground. 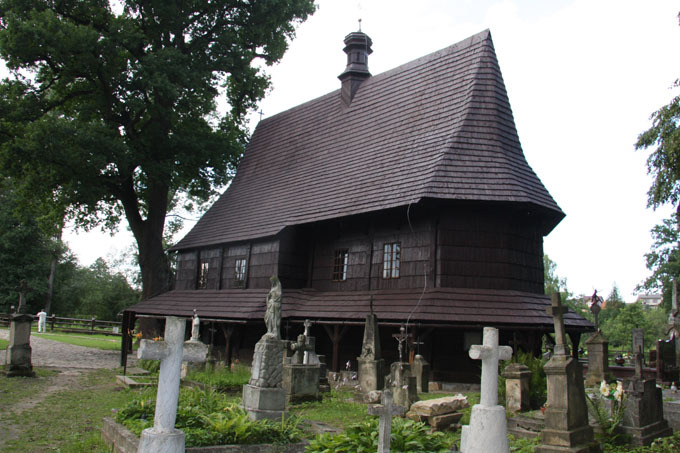 In the afternoon we drove east to the village of Lipnica Murowana to visit one of the prettiest all wooden churches in the area. 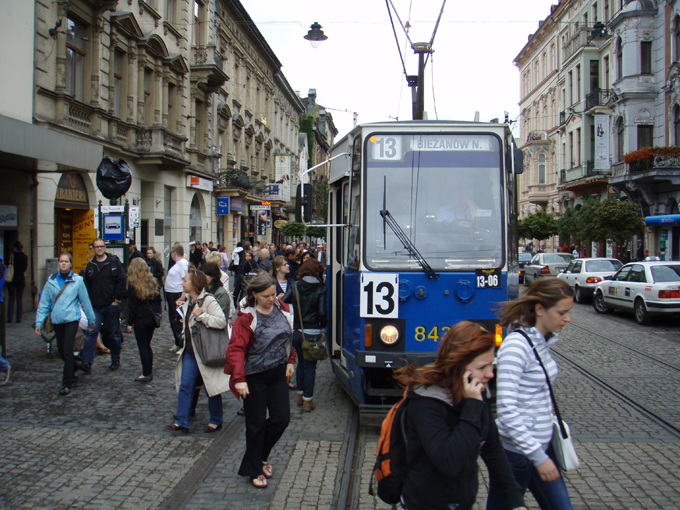 Headed off today in the rain to the centre of Krakow by bus and tram. Public transport is cheap and you can buy a 24 hour ticket that gives you unlimited bus and tram travel around the city for 10.40 zl (about £2.20). 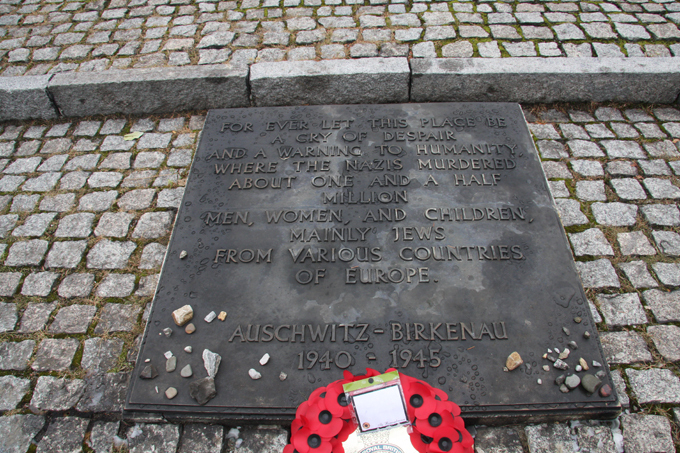 After a quick stop at the tourist information to pick up a map we started the recommended walking tour …. sorry can’t remember the names of the places but started at an old gate house and walked through to the main square. 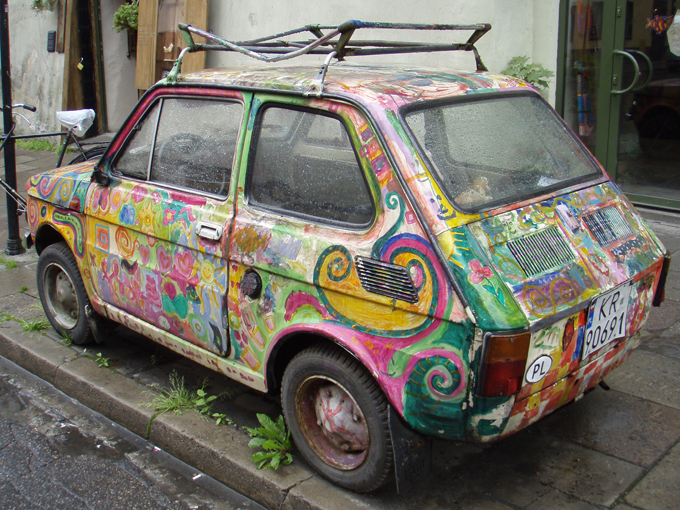 As we have travelled around Poland we have seen quite a few little Fiats … think that they are the old 126. Marjool always says “I like those cars” so thought we better have a picture of one! In the main square there is a big building (whoops can’t remember the name again …. truth is the guide book is in the camper down a few flights of steps, and after a day around the city neither of us will get it!!). It is something like ‘Clothes Market’ but now just sells souvenirs of various sorts. 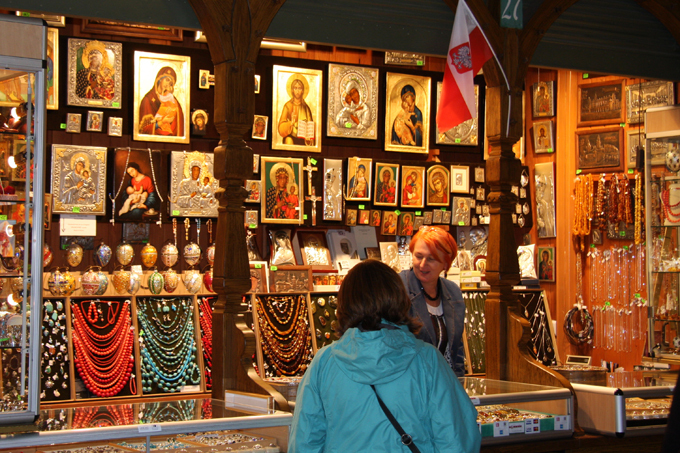 As Poland is a strongly Catholic country several of the shops sold religious gifts. 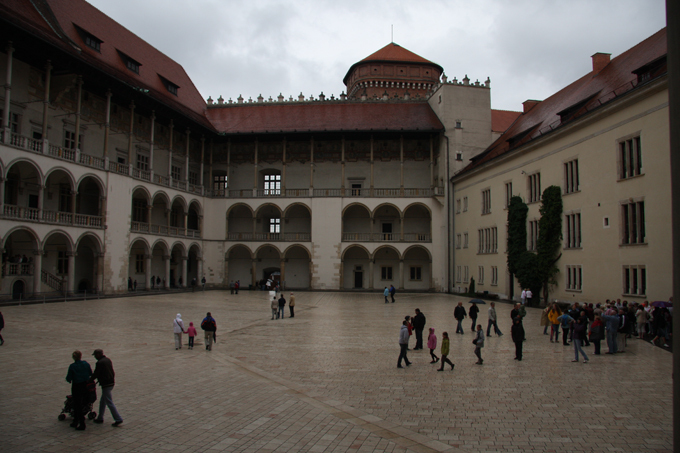 Next stop was Krakow Castle. While walking along the street we got an e-mail from our village about a fruit bottling workshop … a few minutes later we walked past this cafe! Next we walked out to the old Jewish Quarter and looked around the buildings and courtyards. Over the river we continued on to an excellent museum based in the factory where Schindler employed and helped Jews escape the camps during the second world war. 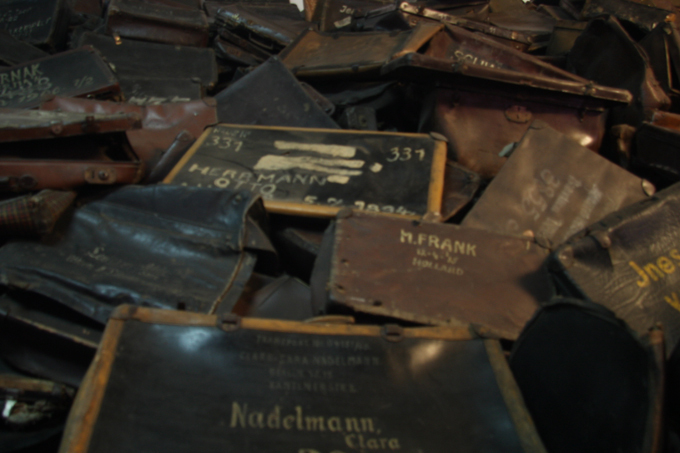 The factory made bomb parts, grenade cases and enameled pots. 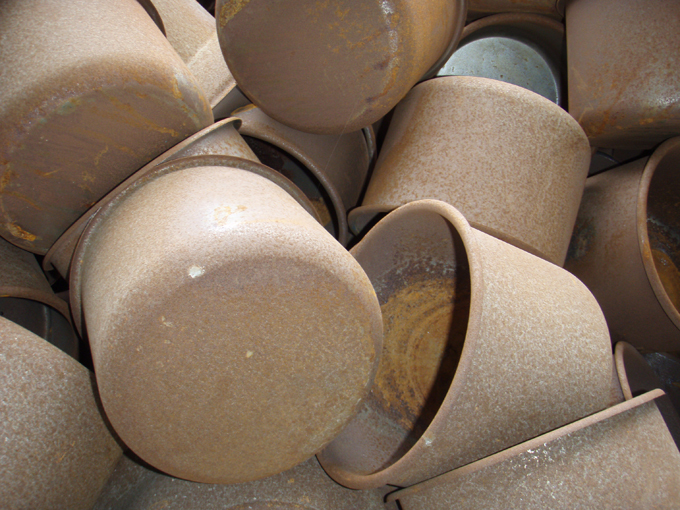 Most of the work was pressed steel. I know …. boring! But i like the way sheet metal can be made into almost any shape!! Its raining on the computer now so off to make dinner! 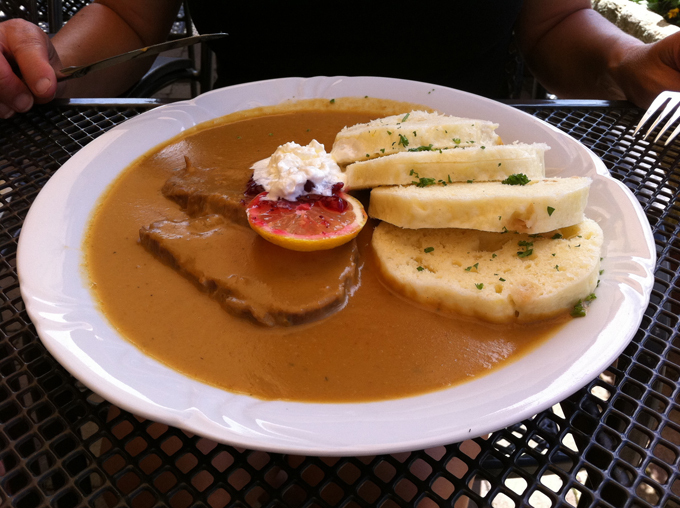 Yummmy …. maybe? 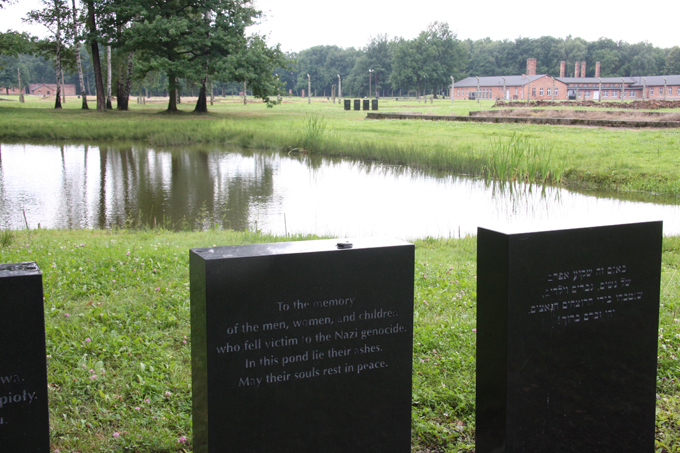 After another night outside Birkenau (big thunderstorm) we drove on towards a campsite outside Krakow called ‘Smok’. 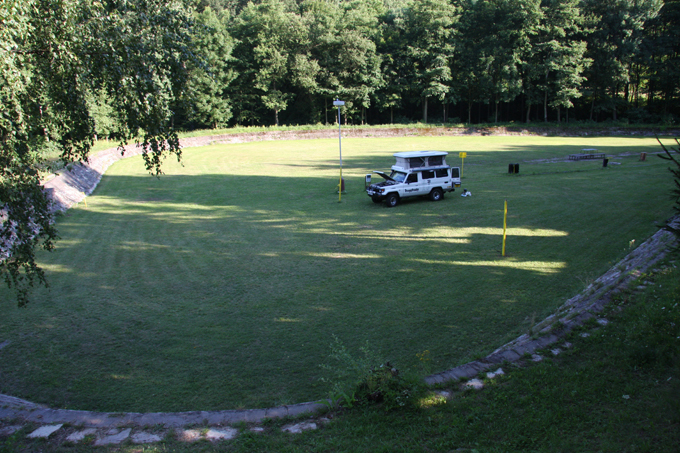 Costs are obviously higher than the country campsites, but it is secure, has good facilities and is only 4 km to the city centre by bus and then tram. You can pick up the bus just outside the campsite. Afternoon spent rearranging some of the storage in the camper and washing clothes. During the afternoon we were reflecting on how different it is travelling in Europe as compared with Australia. There you can travel 2000 Km and the scenery hardly changes (in some places). Don’t get me wrong ….. its lovely but the distances between the places is vast in some areas. Plus each time you stop they still speak English ….. (well Aussie which is almost the same!). Here we have only been gone just over two weeks (I know that because I changed my T-shirt today 🙂 ) and we have travelled only 1444 miles (2311 Km) and have passed through 7 countries including the UK. 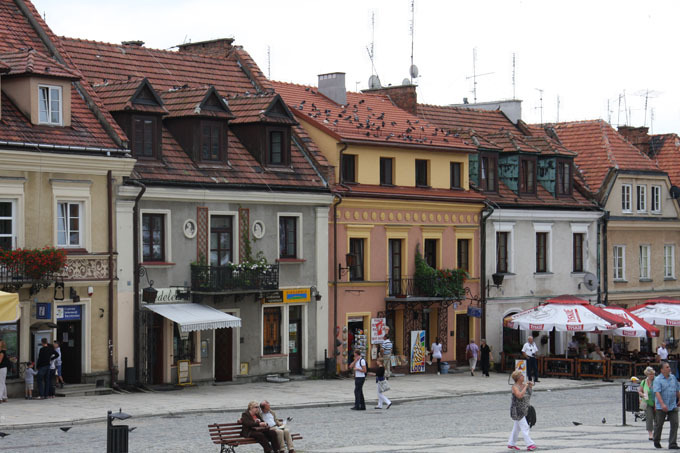 Hoping for a nice day tomorrow to visit Krakow. 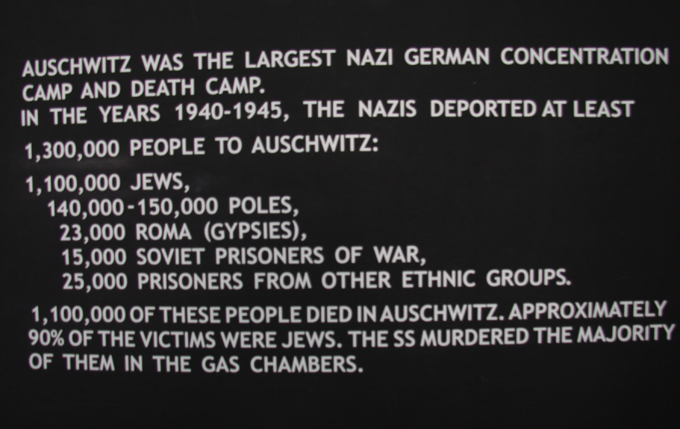 Nothing can prepare you for the size of the concentration camps. 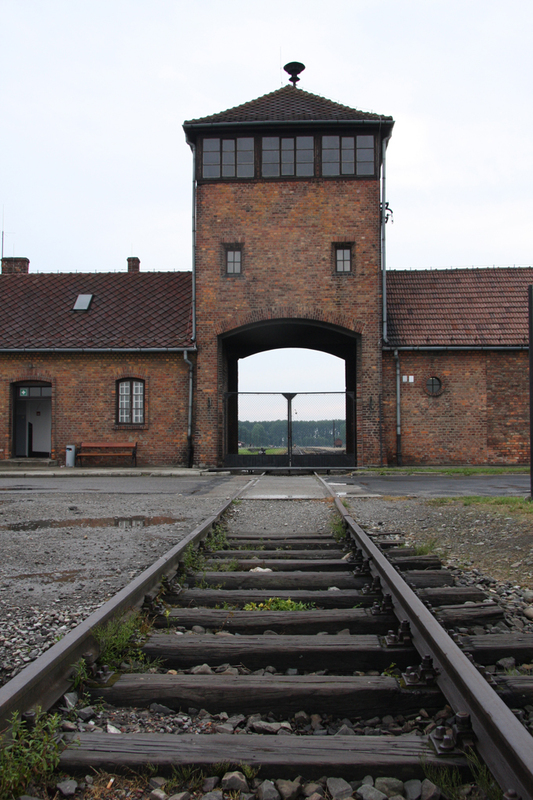 The structures are precisely laid out in symmetrical shape around the railway siding that bought the prisoners in from all over Europe. 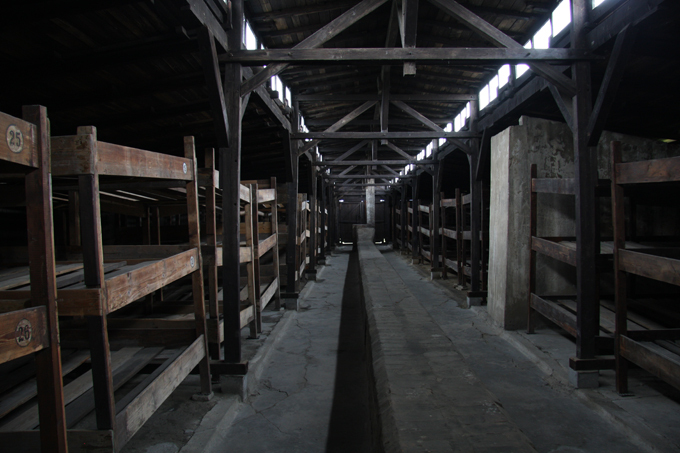 Prisoners were sorted on arrival into those that could work and those that could not. 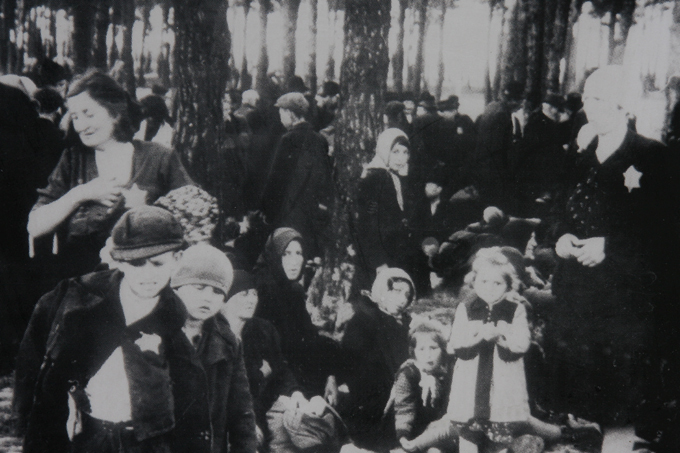 Women with young babies, children under fourteen, the sick, the elderly and disabled were taken straight to the gas chambers to be murdered. 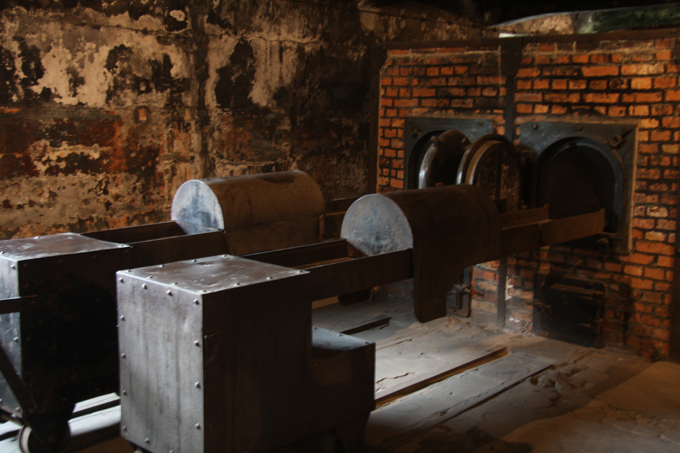 The rest were put to work in such harsh conditions that they usually only lasted weeks. It is all so hard to understand as people are generally kind and look after each other …. why? 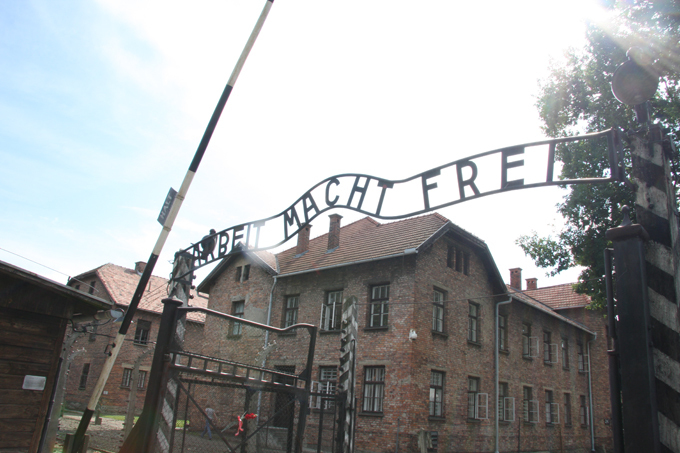 Although distressing, we would stongly recommend a visit to Auschwitz, it makes you realise that what ever little grumbles we have in our daily lives, we are very very lucky. It certainly puts things in perspective. 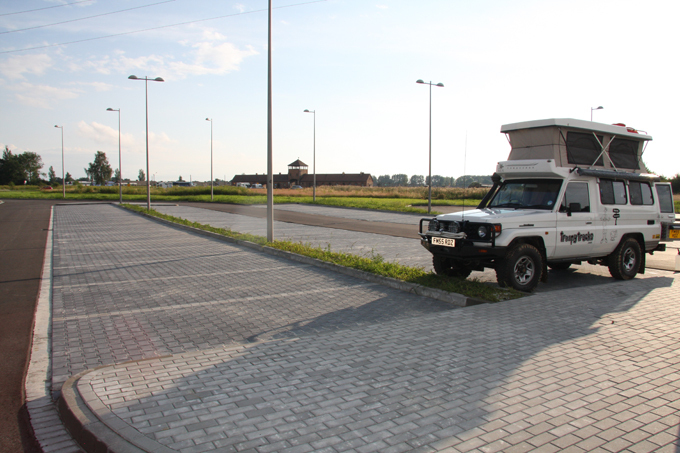 If you are making a visit here in a camper, there is a great new carpark just outside Birkenau. We actually stayed two nights as there is a lot to see. 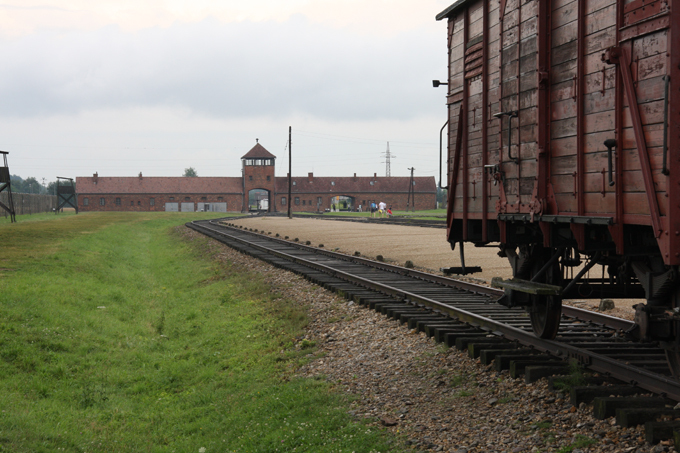 You can then walk over to camp 1 (Auschwitz) and pick up the tour there and they provide a shuttle back to Birkenau and a brief tour there. Cost of tour around £9 per person for about 3 hours. Camping for now is free. 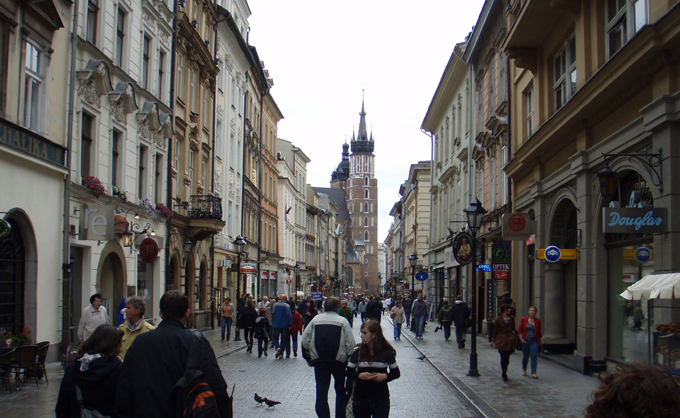 Plan for tomorrow is to head to Krakow. Internet not been quite as easy. 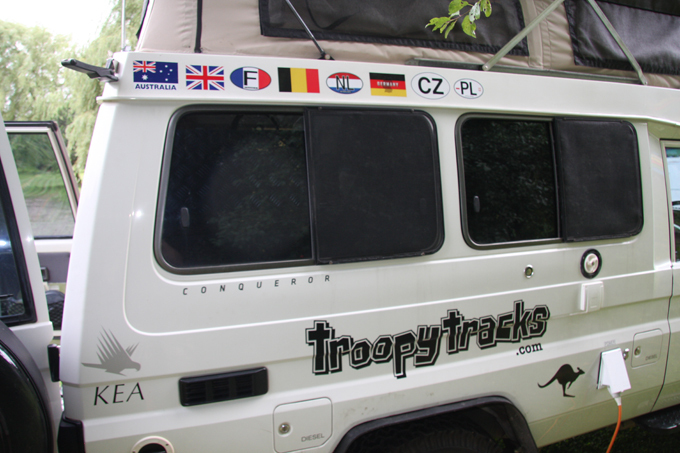 Have been ‘tethering’ phone to computer to update in the comfort of our camper but not worked so far in Poland. So we are now sitting in Mc D’s!! 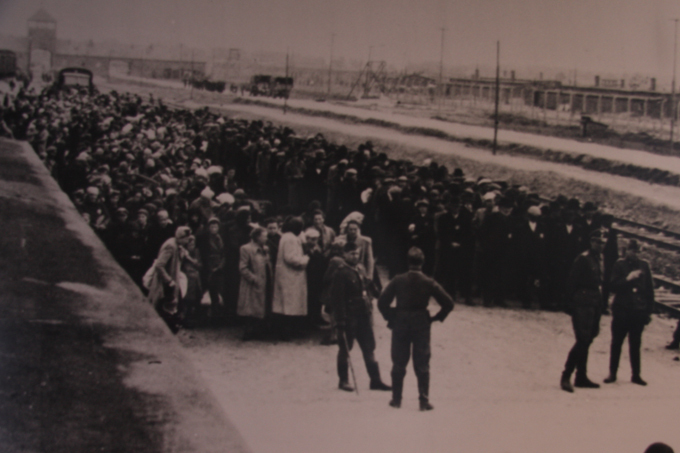 Crossed the CZ PL border with no problem or documents needed. 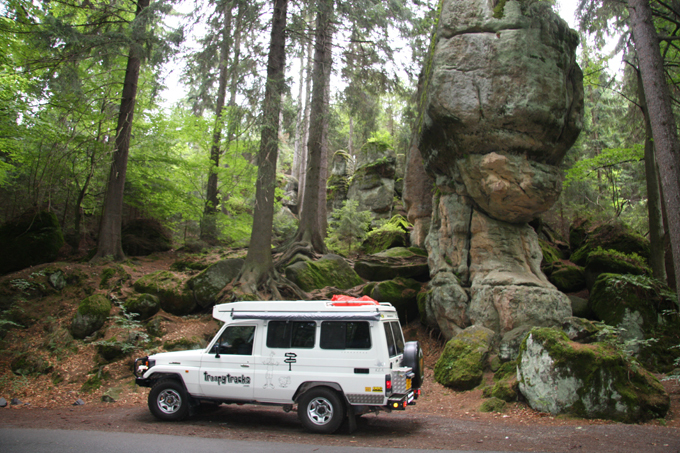 Straight into lovely scenery and a National Park called Gor Stolowych. The rock formations were great. Driving on towards Gluszyca where there are a series of huge tunnels cut into solid rock by 30,000 + POW’s for Hitler in 1942 ish. No one really knows what the plans were for the huge complex of tunnels but there were images of tanks and heavy artillery in the tunnels and so it may be that. The guide spoke in rapid Polish and so it was a bit difficult to understand. Once I know how to add sound bites I will show you what I mean. 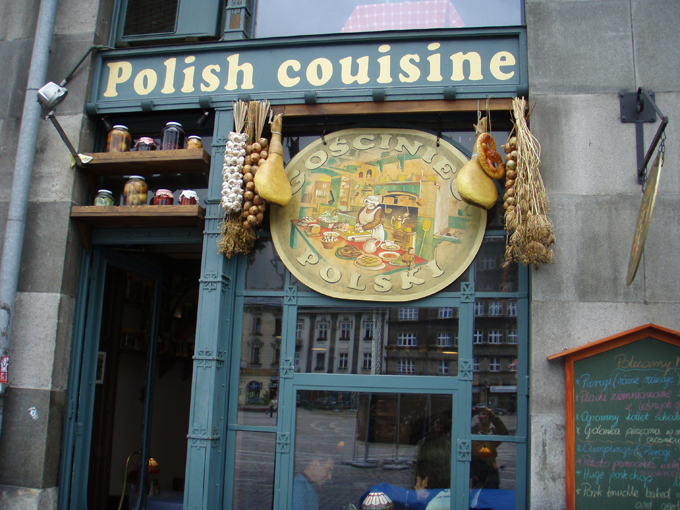 That along with the sat nav trying to pronounce long polish street names is worth a listen! 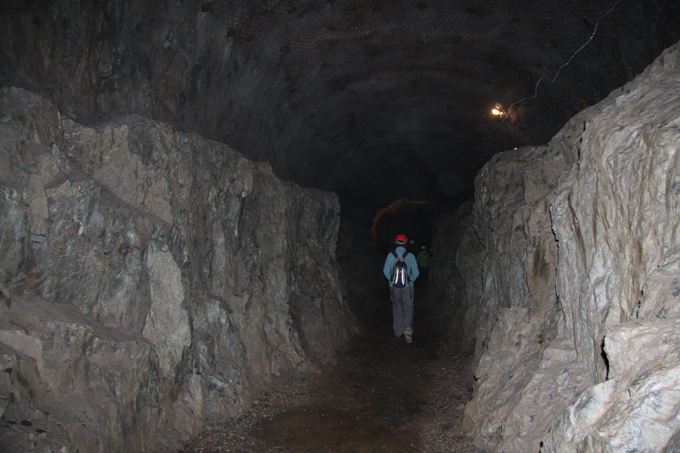 Leaving the tunnels to head towards the lakes at near Nysa (… that looked nice on the map). The scenery was again really lovely. Now on our way towards Krakow.